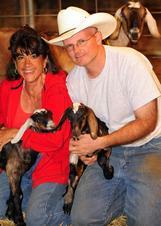 The Finest Nubian Dairy Goats, raised in the heart of South Texas ! We began our herd in '06, with some of the dairy goat industry's top bloodlines. We breed show quality Nubian Dairy Goats with an emphasis on milk production.